Doctor Who as a concept is predicated upon change, and while the Doctor’s regenerations and changing companions are the more dramatic examples even as the settings and supporting casts change with each passing story, sometimes this fact applies to returning villains as well. When the Doctor and Lucie arrive in the unassuming seaside town of Thorington in Suffolk, they soon find that the residents have been submissively reliving the first of September 1991 for years, not asking where the sea has gone or why the same song has been number one on the radio for so long and always wary of the mysterious ‘visitors’ returning. The gradual introduction of the mystery regarding Thorington is superb and sets the scene for the story as a whole wonderfully. Empty and outdated cans in the local store, fallout shelters in every yard, stopped clocks around the village, and even the local newsagent picking up the delivered papers so that he can deliver the same ones again tomorrow- which also happens to be the first of September 1991- are strong visuals by themselves, but the revelation that the citizens do not get hungry or thirsty and do not show up on thermal scans significantly heightens the overall mystery. Ever since ‘Spearhead from Space,’ it’s been known that Nestene meteor showers have been hitting Earth, and having the Soviets responsible for creating a perfect army of Auton spies learning to be English in the fake village in Uzbekistan is a fantastically ostentatious idea that takes the returning foes in a brave new direction. Indeed, with orders stopping following Uzbekistan independence, these autonomous Autons have been allowed to develop a semblance of personality, crafting interpersonal relationships and family units as real as in any human society. As a result, the inevitable re-emergence of the Nestene signalling device is a double-edged sword here, boldly propelling the plot forward logically but also taking away from the incredible situation these particular Autons find themselves in after having been forgotten for so long. Nonetheless, the exploration of the commanded and more driven Autons to preserve the oil that to humans is only a source of fuel but that to Autons is the source of life is nice a dichotomy that makes the most of the setting and also exemplifies just how human this group has become. The reburying of the signal device brings their arc to a satisfyingly open-ended close as they now find themselves asylum seekers who are seventeen years behind, remaining forever a potential weapon should anyone with sufficient knowledge take the appropriate steps. 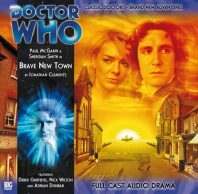 Writer Jonathan Clements has a firm grasp on the Autons but reinvents this particular subset spectacularly with a slower and more measured pace than is usual for The Eighth Doctor Adventures, seeding hints of the truth alongside genuine emotion perfectly along the way. In fact, with so much subtle commentary possible regarding the building of this society and even environmentalism, the only shortcoming of this story is that its length doesn’t allow a completely thorough exploration of this setup. What is offered is wholly satisfying, however, and so there’s never a sense that anything is missing that is absolutely needed from a plot perspective, but the Autons have simply never been presented in such a way and thus warrant much more time spent with them. Still, with the usual strong performances from Paul McGann and Sheridan Smith as well as an impressive performance from Derek Griffiths as Jason alongisde everyone else involved, ‘Brave New Town’ director Jason Haigh-Ellery utilizes his cast to full effect and confidently sets up and resolves the mystery of Thorington with remarkable effect, creating a standout tale for this fledgling second season.